Put Trash in its Proper Place – Littering can get you in Big Trouble! Annual Solid Waste household user fees are assessed to the owner of each residential unit in Vance County. The revenue generated from these fees are used to pay for the disposal of household trash produced by the residents of Vance County including the municipalities of Henderson, Kittrell and Middleburg. 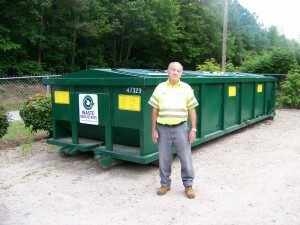 These fees do not pay for the disposal of commercial, industrial or institutional waste. Solid Waste is any garbage, trash or refuse which has served its intended use and is generally being discarded, including solid, liquid, semi-solid or contained gaseous material resulting from industrial, commercial and agricultural operations or residential activities. All residents of Vance county who have paid the annual solid waste household user fee are allowed to take household trash to any of the Manned Solid Waste Convenience Centers in Vance County. The County also provides convenient recycling containers for aluminum, cardboard, newspaper, plastic bottles used motor oil and brown, clear and green glass at these sites. Construction and demolition debris are prohibited from disposal. The County further prohibits the disposal of commercial, industrial or institutional waste at any of the manned solid waste convenience centers. Additional fees are assessed by the City for solid waste collection and disposal services including bulky item, yard waste and backyard trash pickup. The City has a franchise agreement with a private company for the collection and disposal of commercial waste. Contact the City Public Works Department at 431-6115 for additional information. The residents of Kittrell take household trash to one of the manned solid waste disposal site in Vance County. All commercial, industrial and institutional waste generators must contract with a private waste hauler for waste collection. The residents of Middleburg take household trash to one of the manned solid waste disposal sites in Vance County. All commercial and industrial waste generators must contract with a private waste hauler for waste collection.